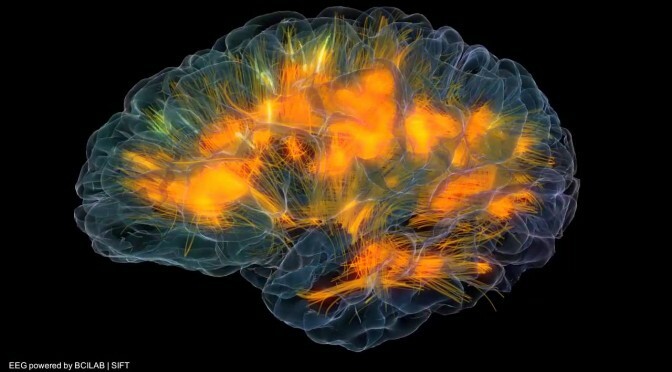 This is an anatomically-realistic 3D brain visualization depicting real time source-localized activity (power and “effective” connectivity) from EEG (electroencephalographic) signals. Each color represents source power and connectivity in a different frequency band (theta, alpha, beta, gamma) and the golden lines are white matter anatomical fiber tracts. Estimated information transfer between brain regions is visualized as pulses of light flowing along the fiber tracts connecting the regions.